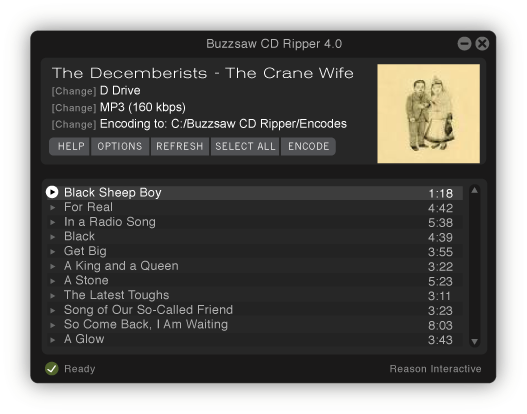 Download Buzzsaw CD Ripper and enjoy all the features - free. Encode CDs at whatever quality you choose. Explore all the options. This is a great way to ensure you'll be happy with Buzzsaw CD Ripper before you purchase. The only limitation of the demo is that you get a maximum of 15 encodes. Once you purchase and enter a license code you will be able to continue using Buzzsaw to encode your entire CD library. Buzzsaw CD Ripper also has a 30 day money back guarantee, so you can be confident when you purchase. Once you decide you want to purchase, it is easy to do so. Simply download Buzzsaw CD Ripper (if you have not already done so) then buy a license code. In most cases your license code will be emailed to you within minutes. After you recieve your license code, start Buzzsaw CD Ripper. Click "Purchase & Unlock Buzzsaw." Enter your license code and you may continue using Buzzsaw CD Ripper. If you want to get a feel for the ease of use of Buzzsaw CD Ripper before you even download it, please view the tutorial in the support section. Encode to MP3, Ogg Vorbis or WAV. Buzzsaw will download artist, album and song information as it encodes - automatically creating tidy folders for each CD and writing ID3 tags for each track. This 15-use download is 2.6MB.